It is a 2.8" display with 320x240 16-bit color pixels and a resistive touch overlay. 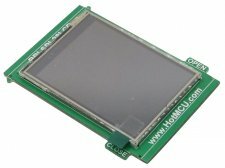 The plate uses the high speed SPI interface on the Pi and can use the mini display as a console, X window port, displaying images or video etc. Best of all, it is use FPC cable connect with Raspberry Pi. It's designed to fit nicely onto the Pi Model A or B but also works perfectly fine with the Model B+. Uses the hardware SPI pins (SCK, MOSI, MISO, CE0, CE1) as well as GPIO #17, software and hardware is compatible HY28B.